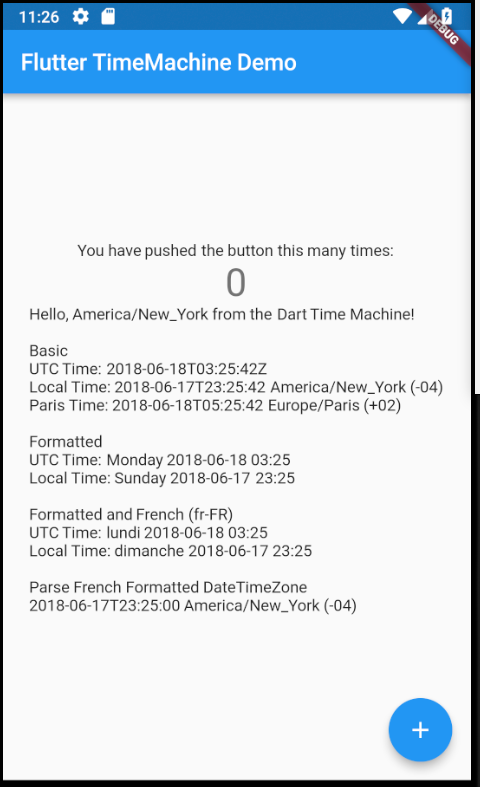 The Dart Time Machine is a date and time library for Flutter, Web, and Server with support for timezones, calendars, cultures, formatting and parsing. The last two/three? are generic library goals. Time Machine is a port of Noda Time; use it for all your .NET needs. Documentation was ported, but some things changed for Dart and the documentation is being slowly updated (and we need an additional automated formatting pass). Don't use any functions annotated with @internal. As of v0.3 you should not find any, but if you do, let me know. External data: Timezones (TZDB via Noda Time) and Culture (ICU via BCL) are produced by a C# tool that is not included in this repository. The goal is to port all this functionality to Dart, the initial tool was created for bootstrapping -- and guaranteeing that our data is exactly the same thing that Noda Time would see (to ease porting). You'll need this entry in your pubspec.yaml. 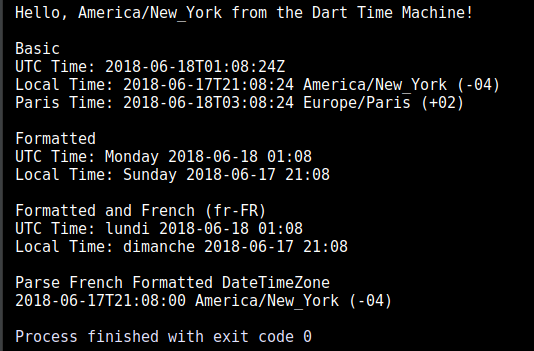 // TimeMachine discovers your TimeZone heuristically (it's actually pretty fast). Once flutter gets Isolate.resolvePackageUri functionality, we'll be able to merge VM and the Flutter code paths and no asset entry and no special import will be required. It would look just like the VM example. toString on many of the classes will not propagate patternText and culture parameters. 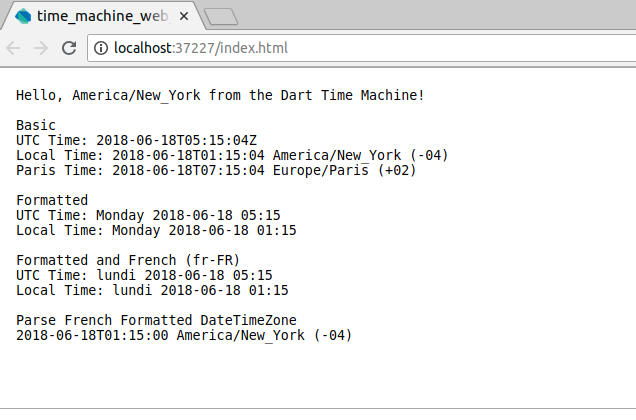 Instant and ZonedDateTime currently have toStringDDC functions available to remedy this. We learned in Issue:33876 that dynamic code uses a different flow path. Wrapping your code as dynamic will allow toString() to work normally. It will unfortunately ruin your intellisense. See Issue:33876 for more information. The fix exists, now we just wait for it to hit a live build. toStringDDC instead of toStringFormatted to attempt to get a negative contagion coefficient. If you are writing on DartStable today and you need some extra string support because of this bug, let me know. Update: Dart 2.0 stable did not launch with the fix. Stable release windows are 6 weeks. Hopefully we get the fix in the next release (second half of September).